“People need to be treated equally. You should help other people too. I know I love helping others whenever I can and it is important to give back,” said eleven-year-old Sophia A. 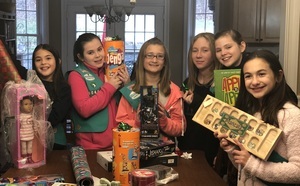 Using a portion of their cookie sale proceeds, the troop of eight middle-school aged girls purchased gifts on the wish lists of disadvantaged children served by the Boys & Girls Village organization. Monetary donations were also gathered from troop families to help meet their needs, for a combined donation of over $300. The troop is a long-standing community partner with Boys & Girls Village, which serves over 800 at-risk children each year. 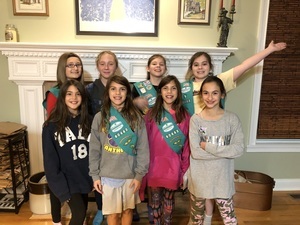 In addition to providing financial contributions in the past, the troop has also conducted a pajama drive, collecting and donating pajamas to these children in need. “We are all in this together, and it is good to care for kids in need,” said eleven-year-old Emma T.
With the majority of clients ranging in age from 5-17 years old, Boys & Girls Village serves children and families in at-risk situations. The organization provides a broad range of services including behavioral health services, educational and vocational programs, and permanency planning. In its 75-year history, it has transformed over 30,000 lives across the state. 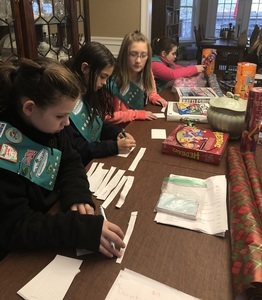 To explore how your group can partner with Boys & Girls Village, or to learn more about the organization, please visit www.bgvillage.org or call 203-877-0300.